This is backed up by commentary on whether or not we should wear heels or whether we should go to the pub, and what kind of childcare should be used whilst we enjoy equality, all issues connected to feminism and important in everyday personal choice. After all, isn’t the basis of equality the right to choose our lifestyle without facing oppression or threat? Even so, it’s difficult to see how this apparently new-found freedom to make our own decisions applies to everyday women still facing daily oppression. As a psychologist with a background in women’s health I have worked with women, and men, who still face a daily battle with a fiercely patriarchal system and do not have choice over pay, healthcare or personal safety. Whilst some women are free enough to be able to apply feminist choice to everyday matters, many are still undergoing a level of oppression that is staggering. This may sound like an exaggerated statement, but at least a quarter of 25.2 million adult women in the UK today will face oppression at some time in their lives in the form of domestic violence. When I quote this statistic to people, their first reaction is to question it. They usually argue that it isn’t possible that two women per week are killed by current or ex-partners. How could it be, here today? Do the police know about it? Of course the police know about it. We all know about it, even the government, and they have their own information page. So we all know about it, but it’s still happening, and no one talks about it. Then, when the full horror sinks in, they ask why something isn’t being done about it? But something is being done about it. Hundreds of organisations, mostly charities, are working all over the UK to help women and men who experience domestic violence. As well as the debates about consumerism, the shoes, the cardigans, the make-up and who will open doors for you, feminists are working to stop other people being killed. Sounds dramatic, doesn’t it? It sounds even more dramatic when we realise that most of these organisations have just faced major funding cuts. The consequences of these funding cuts are clear: women will continue to be killed by current or ex-partners. If help to stop domestic violence is cut, then two women per week, possibly more, will still be killed by current or ex-partners. I wonder if the families of these women will consider that ‘In the Western world, the feminist argument has been definitively won…’? Raise awareness. Tell someone today about the two women per week who are killed by a current or ex-partner. Talk about it. Volunteer. Do something to save lives. If you do have the freedom you deserve to choose, choose to help. This morning I watched a senior politician queried on breakfast TV about how the government’s policy on financial cuts would affect women. The answer alluded to ‘problems with shopping’. If only that were the full extent of the damage. Image is by flickr user Feggy Art, shared under a Creative Commons license. 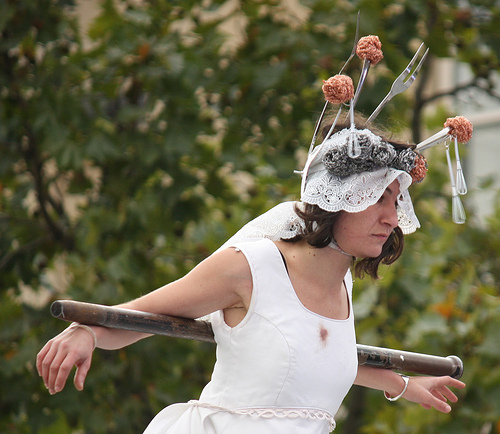 It shows a woman performing on the theme of domestic violence on the ‘fourth plinth’ in Trafalgar Square. For more information on the performance, and to see the whole set of photographs, see here.